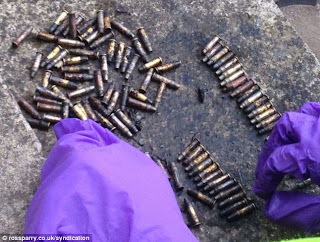 The Backwoods Engineer: Britain: "Men Without Chests" find "Machine Gun Ammo"! Britain: "Men Without Chests" find "Machine Gun Ammo"! Britain has been turned into a nation of wimps; in CS Lewis' words, "men without chests". Ol' Backwoods found this story courtesy of Arms and the Law, but the story was originally in the UK Daily Mail Online, hilariously titled, "Couple discover 7,500 machine gun, shotgun and pistol bullets... while weeding their pond"! An unmarried British couple (is there any other kind?) finds some rimfire .22 ammo in their pond, and FREAKS OUT! Mr. Tipping's Horror! 'Machine Gun Bullets'! Ms Mercer added: 'I rang my dad because he used to be in the Navy, and he told us not to touch them because they could be dangerous. OH NO Mr. Tipping! In your pocket, you say? Horror of horrors! Gun things in its pocketses! Dad says don't touch them! They might be DANGEROUS! 'It seems really stupid now but I didn't [realize] they could be dangerous, I just wanted to find out what they were. 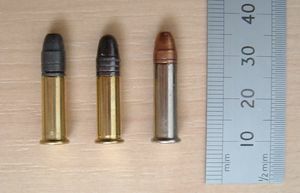 They were common .22 caliber rimfire cartridges, like the cleaner ones shown at right. It appears that there were some other calibers, but most were .22 rimfire. The chestless Mr. Tipping, knowing nothing of firearms like most Britons, actually BELIEVES his ignorant friend "that used to live on a farm" that they were 2.2mm 'bullets'! I don't think I've ever heard of 0.87 caliber (2.2mm) 'bullets', Mr. Tipping. Them'd be awful small. Methinks you've got your calibers and millimeters mixed up, there, sweetcakes. It might interest Mr. Tipping to know that I, and millions of other Americans, spent their childhood days with their pockets full of loose .22LR cartridges, out hunting or target shooting. And NONE of us died from it. By the way, Ol' Backwoods carries 25 rounds of ammunition of a much larger pistol caliber EVERY DAY, along with the pistol to fire them, and that's not even typical. MILLIONS of Americans carry more than that for their carry pistols, EVERY DAY. As most of my readers already know, unless inside of a gun, cartridges are not dangerous per se, as the primer is not going to fire inside of the magazine. Not even a rimfire cartridge will do that. And if it did go off in your pocketses, all you'd get is a little burn on your leg, and a firecracker-like pop. Without a container (like a barrel with a locked breech) to build up a pressure pulse and guide the resulting gas expansion, the bullet itself is not going to do anything more dramatic than pop off. Plus, those were WET, from their pond. The primers probably wouldn't fire anyway! Sad thing is, in the big cities, many Americans are just as ignorant and lily-livered when it comes to firearms as these British "men without chests". And that's exactly the kind of men that gun banners like Bloomberg would have Americans become: spineless, without conviction, and dependent on the government for their very lives. Like watching those wankers getting ripped to shreds in "Shaun of the Dead", one by one, because they didn't know the first thing about using a gun, or self defense, or being quiet. Nancy boys running to the cops about some old, wet ammo, too afraid to clean it up and test it out, and save some of it at least. Reminds me of the twats there who find old Viking, or Roman gold, and TURN IT IN! They're not dying from an oppressive, overwhelming govt., they're dying from a National Suicide. Sean, great comment. I fear that "national suicide" you speak of has reached our shores. ...We shall fight with growing confidence and growing strength in the air, we shall defend our island, whatever the cost may be. We will fight them on the beaches unless they throw wet ammo on the ground, in which case we shall call the local authorities and console one another at the pub.